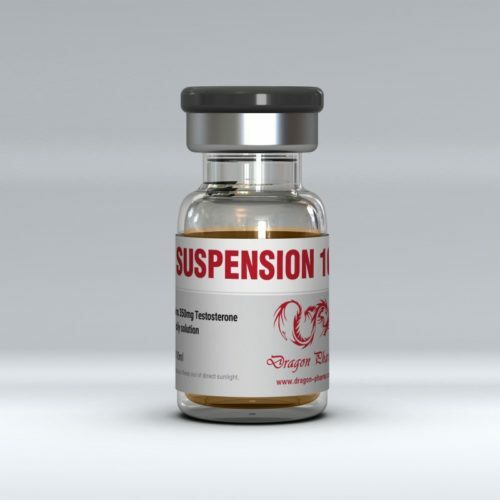 Suspension 100 is an water based solution without a Testosterone ester, which is the fastest drug, and starts to act in your body instantly, but unfortunately has a high incidence of side effects. Many Testosterone Suspension preparations contain, as a solution, oil or propylene glycol. Usually this drug is used before the competition, since the drug does not leave a trace within a day after its application. Suspension of testosterone is also known as Suspension 100 – this is one of the first anabolic steroids that was invented back in the 1930s. This drug contains the purest Testosterone, 100 mg of active substance. In other preparations such as: Testosterone Enanthate (Enantat 250, Enantat 400), Testosterone Propionate (Propionat 100), Testosterone Cypionate (Cypionat 250), an ester is used. First of all, Suspension 100 has a very short half-life, it has the fastest anabolic effect, you will feel the action of the drug the day after the start of the cycle. There is a theory that if you inject into certain muscles, they grow faster and become larger than the rest of the group. However, this theory is erroneous, and more than once it was proved not to be consistent. Although this drug has a large set of positive effects, it also has pronounced strong side effects. Suspension 100 has a high androgenic activity, often causes acne, water retention and gynecomastia. For this reason, PCT is mandatory, you need to start taking from the beginning of the cycle. Has a toxic effect on the liver only in very high doses. Suspension 100 retains a high concentration in the blood only 2-3 days, so intramuscular injections need to be performed every day. To get maximum result, this drug is injected every day. The average daily dose varies between 50-100 mg. The recommended use of the drug (cycle time) is about 4-5 weeks, as this will significantly affect the hypothalamic-pituitary-testicular arc, with the suppression of the secretion of endogenous Testosterone. Very often Suspension 100 is combined in one syringe with other anabolic preparations on water base, or with vitamin B12, due to which it reduces pain. Also, to eliminate pain, the drug is often mixed with a solution of Novocaine or Lidocaine.